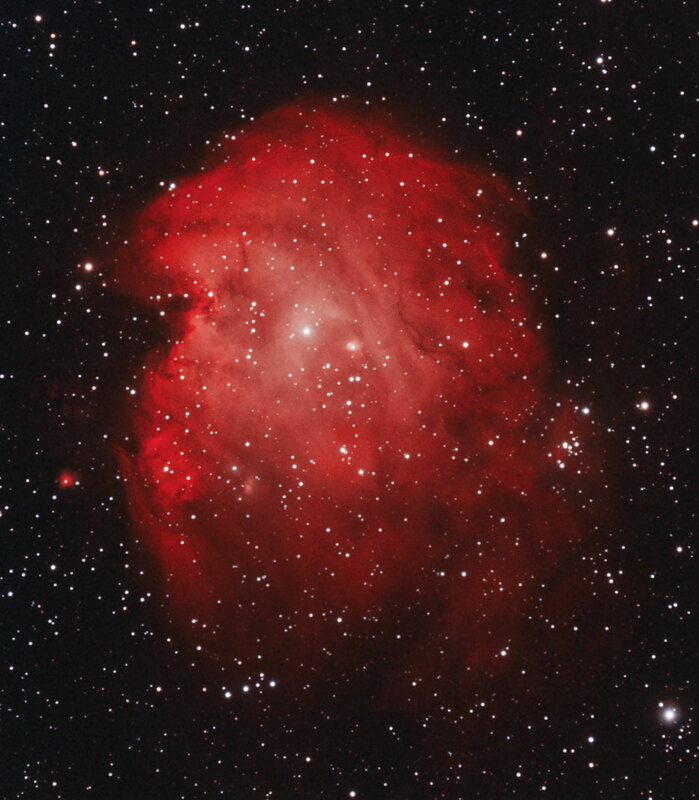 Adrian Brown captured this false colour image of emission nebula NGC 2174 in Orion on the 29th October 2008 using narrowband filters. This object is nicknamed the Monkey Head Nebula because depending on how you orientate the image you can see the face of a monkey. Adrian chose a 'north' down orientation because the face seemed more prominent to him. Can you see the monkey face? The technical details for this image are: 7 x 20 minutes through a 6nm Astronomik Hydrogen-Alpha filter. 6 x 20 minutes through a 13nm Astronomik OIII filter. Skywatcher 80ED Pro refractor @ f/6 using a William Optics 0.8x focal reducer. ATIK ATK16HR CCD camera. Maxim DL 4.53 was used to calibrate and stack the raw exposures. Registar 1.0 was used to align the hydrogen-alpha and oxygen III data. Photoshop CS2 was used to process the stacked data and a false colour image was created by assigning the hydrogen-alpha data to the red channel, and the oxygen III data to the blue channel. Noel Carboni’s Photoshop Actions were used to create a synthetic green channel.